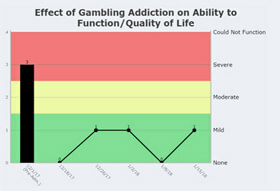 INSIGHT Addiction & INSIGHT Behavioral. Now you can see the history of a patient at a glance and easily update it. 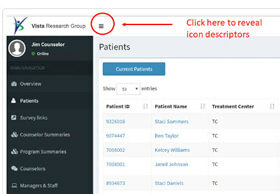 Go to the History page by clicking on the History button on the Patient's dashboard. For patients discharging without completing treatment, our standarized options allow Vista to compare your center's treatment completion rates with national norms while also collecting data on interesting questions such as how often patients are being forced to leave for insurance reasons. We've simplified the alerts clinicians receive after patients submit surveys. Critical alerts will only be sent in potentially life-threatening situations where a patient reports having suicidal thoughts and some intention of acting on them. 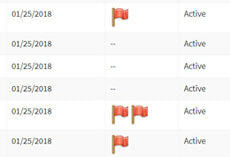 Basic (one flag) alerts will be sent when patients report suicidal thoughts without an intention to act or if they report self-harming or using drugs or alcohol during treatment. Set how quickly you want to be notified of different types of alerts on your Settings page. Can't figure out how to do something? Check out INSIGHT's Knowledge Base by clicking on the Help button at the top right of your INSIGHT screen. The searchable Knowledge Base will give you step-by-step instructions, illustrated with helpful screen shots! For example, are you wondering what happened to the descriptions for the icons on the left navigation bar? Bring them back by clicking on the three bars on the top of your screen (see picture on the right). To help clients use INSIGHT effectively, Vista now provides free quarterly audits. 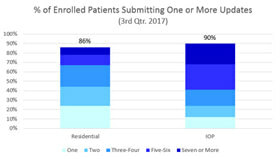 We'll compare the patients enrolled in INSIGHT with your census, report how frequently patients are submitting updates, and make sure clinicians are logging in regularly. You'll find these audit reports particularly helpful during Joint Commission accreditation surveys. If you have questions or missed your team's original training session, drop-in training sessions are offered every Friday at 1:00 p.m. EST. Just sign up here! And, as always, if you have any questions, feel free to email support@vista-research-group.net or call toll-free (800) 215-3201 ext. 2. Our friendly support personnel are usually available on weekdays from 8:00 a.m. to 9:00 p.m. Eastern Standard Time (EST)!